The August ARRL UHF contest is over, and I had a blast roving the Pacific Northwest as WW7D/R. It’s true that I enjoy all of the VHF+ contests, but the UHF contest has provided significant and interesting challenges for me in the four years I have participated. This year, it was all about being all mode on all four bands that a limited rover is permitted—222 MHz, 432 MHz, 903 MHz, and 1296 MHz. I almost achieved this last year, but did not have a functioning 1296 MHz transverter. This year I did. Preparations for the contest first began with assembling an amplifier for 903 MHz. I purchased a second hand Stealth Microwave 900 MHz amplifier that puts out up to 60 watts. The amplifier is for commercial cell phone equipment or some such thing. The coil of coax (RG-178) acts as an attenuator to lower the transverter output from 8 watts to 0.1 milliwatts!!! That is about 40 db of loss, which is a little less than 100 feet of RG-178 at 900 MHz. The 250 Watt power supply sits on the other side of the chassis. My initial tests of the amplifier were with scheduled QSOs with Eric, N7EPD, and Mike, KD7TS. During one initial tests, the 24v power supply died. Looking into it a little more, it turns out that the amplifier is class A, which means it draws lots of current just sitting with the PTT switch closed but without amplifying anything. In other words, turning the amp on for CW mode, but not sending any characters, the amp draws something like 6 amps at 12 v.
I ordered a 600 watt 12v to 24v power supply to replace it. That did the trick, and I was able to make QSOs with N7EPD and KD7TS by bouncing a signal off the Olympic mountain range. I was totally blown away by this. Next on the to-do list was getting a Down East Microwave 1296 MHz transverter working—specifically getting the LO to oscillate. At just about the same time Jim, K7ND, reported that he had purchased and tested one of the SG-Lab 1296 MHz transverters that had been popping up on Ebay. He had good things to say about the transverter and brought one for show-and-tell at a PNWVHF lunch. These puppies were a mere $200 and put out 2 to 2.5 watts, and had many advanced transverter features. And they are tiny. It was almost mid-July and time was short. I decided to buy a working transverter rather than risk not getting my DEM transverter working in time for the contest. The transverter arrived in about 10 days, and was amazing. It was very simple to interface to the old Yaesu FT-290 I had picked up to serve as an IF rig. Even at 2W out, I was able to make QSOs using a 24 element loop yagi with Jim, K7ND, and Mike, KD7TS, again, bouncing signals off the Olympic mountains. But I wanted more. A couple of years ago I picked up a very old 1296 MHz amplifier, model 2316 PA. The amp uses discrete components and puts out 18 W when driven with 1 W. Last year, I used the amp with a hand-held 23 CM FM radio, and it worked quite well. With only days until the contest, I needed to build two more components: a TR relay/sequencer in order to use the amp with the 1296 transverter in split TX/RX mode, and a box to switch the IF rig’s RF and PTT signals between the 903 MHz transverter and the 1296 MHz transverter. I spent a couple of days thinking about and then assembling components. On the Thursday before the contest, at about 2pm, I started construction. A Picaxe 18M2+ microcontroller was used to handle the logic. The rest was largely LEDs, resistors, and relays. The TR relay was a standard 12v SMA relay. But for the IF switch, a 12v latching SMA relay was used. I have a handful of these relays and they are perfect for this task provided one has something like a Picaxe to send pulses to work the switch. With a few interruptions for dinner and dishes, everything was working by midnight. This was my first “real” Picaxe project, and it went very well. The programming was a piece of cake. The hardware was easy because I used a Picaxe project board (CHI030B) that includes a ULN2803A Darlington transistor array chip for directly driving the relays. Friday morning I packaged everything into a project box. After that was the task of mounting the 903 transverter and amplifier and the 1296 transverter/amplifier/TR switch/IF switch onto the equipment rack. And then there was the matter of installing everything into the truck. All that took until about 9 pm on Friday. It was quite similar to my 2013 route but using a different spot near Mt. Pilchuck in CN98, one stop at a new location in CN87, a different CN97 stop, and slightly different stops in CN86 and CN96. I posted the schedule here. The antenna stacks were quite similar to last year’s. The plan was to have antennas for four “all mode” bands (222 MHz, 432 MHz, 903 MHz, and 1296 MHz) both front and rear, and additional vertically polarized antennas for FM on 440 MHz, 927.5 MHz, and 1294 MHz. I didn’t bother with a vertically polarized antenna for 223.5 MHz, because I rarely come across anyone using vertical polarization on that band. In all, there were 12 yagis hanging off the truck. I did not include a 2m yagi this year, but had a whip set up in case coordination was needed on 2m. Seven runs of LMR-240 fed the front stacks. Labeling and installing seven runs of coax and a rotor control cable from the front bumper through the engine compartment, under the chassis and into the cab through a stock hole under the passenger seat is a major undertaking. Coax runs for 432 MHz, 903 MHz and 1296 MHz were LMR-400, which I’ve not used before out of concern that the antennas would be too difficult to set up. But it worked pretty well in this application. A full four-band limited-rover set-up is really an 8-band set-up, since equipment to do SSB and CW likely differs from equipment for FM on the same band. On top of the rack is the 1296 MHz transverter/amp/TR switch/sequencer/IF switch. Also on top is a K1EL Winkeyer used for CW. Below that is the 903 MHz amplifier assembly, including the coax attenuator. Below that is a Yaesu FT-290R 2m all mode rig that serves as the IF for 903 MHz and 1296 MHz transverters. Below that is a TE Systems 2212G amplifier, 100 Watts on 222 MHz. On the left, barely visible between the mics is an Elecraft XV222 222 MHz transverter. On the right side with a blue display is a Jetstream 222 MHz FM rig. Also on the right side with an amber display is the Kenwood TK-981 927 MHz FM rig. Hanging on the right side is an Alinco DJ-G7 for 1294 MHz FM. On top of the upper rotor is a Tascam DR-1 digital audio recorder that serves as a primary log. Below the upper rotor is a control for the antenna switching relays. For 222 MHz the two antennas are switched between the two rigs. Three other switches are SPDT relays to switch 432 MHz, 903 MHz, and 1296 MHz between the front and rear antennas. Not visible on the right side of the rack is a manual switch to move the 440 transceiver between the front and rear antennas. The entire rack was secured with a seat belt and straps around the back of the seat. Saturday started with a leisurely drive to Mt. Pilchuck. As I climbed the mountain, the truck started overheating. The truck had started overheating during the July CQWWVHF contest. In the intervening weeks, I had done the usual routine maintenance that I though would take care of the overheating. Not so. When I got to the spot, I felt the front of the radiator and confirmed that the overheating was a partially clogged radiator. This is the vehicle equivalent of atherosclerosis that happens on 25 year old vehicles with 200,000+ miles, and the cure is a radiator transplant. A short-term fix was to use the “auxiliary radiator”—the cab heater was on full blast while climbing hills for the rest of the trip. Of course it had to be a hot weekend in the normally-cool Pacific Northwest. I arrived at CN98 to find Ray, W7GLF. He had tried the usual CN98 location on a shelf off the north face of Mt. Pilchuck. There was a big camping party, so he came to this alternative location. But the trees were too high to make this a good portable location for him, so he headed for nearby Green Mountain. You know what is frightening? Calling CQ for the first 60 seconds of the contest and getting no response. I started checking for obvious mistakes when I heard N6LB calling CQ on 222 MHz. Things picked up after that. Jim, K7ND, was next, and the three of us went to 432 MHz. Jim and I then went to 1296 MHz and 903 MHz and made easy QSOs. Hot damn…this stuff works! Eight minutes into the contest, I worked Mike, KD7TS, on 223.5 MHz. He had traveled to Ocean Shores (CN76) for the day. His excellent signal suggested that we might be able to work on 903 MHz and 1296 MHz. After a 432 MHz QSO, we worked on 903 MHz. It wasn’t until later in the first hour that we completed a QSO on 1296 MHz. Thirty minutes in, I heard my buddy Etienne, K7ATN, on 223.5 MHz with an excellent signal. He was on the summit of Mary’s Peak, Oregon (CN84fm) at 4100′. It was an easy 260 mile FM QSO. We didn’t manage to work on 432 MHz. Just as I was getting ready to leave, Ray, W7GLF, showed up from CN98 on Green Mountain. We quickly worked all four bands (four multipliers for each of us) so that I could get underway. The next stop was Lake Stevens High School, CN88 at 400′ MSL. This location was a mistake, and I should have known that from last year. The spot is pretty good for VHF contests, but the RF noise on 903 MHz prevented any QSOs except with nearby W7GLF. Alternative CN88 locations that are higher are hard to find without traveling an hour to the north. But that probably would have been more fruitful. Next year. A couple miles away, at the NE corner of CN87, is another school at about 400′ MSL. This new-to-me location was much quieter, but even less productive. It did allow me to work W7GLF on four bands, but I could have done that by pulling over to the side of the road and using the front antennas instead of a full set-up. It might be a good VHF location, but for the next UHF contest I’ll skip this spot. Next on the agenda was an hour and a half trip through CN87 to…. Mud Mountain is a easy stop near the CN97/CN87/CN96/CN86 intersection that sits at 1,700′. It is moderately productive on UHF+. The haul included 6 QSOs on 1296 MHz and three QSOs on 927.5 MHz. It was in CN97 that the first big problem occurred–903 MHz went half dead. I could hear just fine, but people could not hear me. The transverter was putting out power, but the amplifier, apparently was not. At some point I noticed I had left the transverter PTT switch on while the IF rig was in CW mode. Remember…this is a class A amplifier, so it gets hot with the PTT switch closed, even without transmitting. I imagined he amp overheated and died. On the other hand, the inexpensive 12v to 24v power supply was the lowest quality piece of electronics in the system. So, perhaps that was the problem. I decided I would do surgery to try and bypass the amplifier once I got to CN96. That would only work if the 24v power supply works, because the internal TR relay was a 24 volt relay. (I had a stand-alone relay, custom built by K7ND for the transverter, but left it at home. Had I remembered to bring that relay along, it would have taken me 30 seconds to reconfigure the transverter to bypass the amp!). The next stop was about 2000′ MSL in CN87 at the SE corner of the grid. I worked a few more stations without setting up the front antennas. The front antenna snagged three more 1296 MHz QSOs. Alas, 927.5 MHz FM didn’t work well from here. A couple miles up the road, at 3000′, I did a quick series of QSOs in CN86, again, without setting up the rear antennas. The Pacific Northwest UHFers were fantastic…we completed 21 QSOs in 9 minutes, including three on 927.5 MHz FM and six on 1296 MHz. A quarter of a mile up the road, the performance was repeated with 22 QSOs in 10 minutes, again just employing the front antennas. I turned my attention to diagnosing the 903 amplifier, occasionally making calls. In the middle of this, a car came down the road traveling back to civilization, and a young woman jumped out to ask what I was doing. After I mentioned ham radio she said she was a new ham—KG7GWD. And she had a hand held with her! We worked on 446 MHz, and I described to her where CN86 began. I wanted to describe where CN87 started, but her passenger was eager to get going. A few minutes KG7GWD/R worked me from CN86. That was two new QSOs and two new multipliers! If I had had my wits about me, I would have moved to CN86 and worked her again. (That would have been difficult with the 903 amplifier disassembled and not secured…but still). Instead I kept doing surgery and occasionally calling. KB7ZEN responded to my CQ on 223.5 MHz. He was in CN86 (new multiplier!). And he had other bands. We worked on 432 and 927.5 MHz (new multiplier!). Here, again, I should have ventured 1/4 mile down the road into CN86 and worked him again. I was too obsessed with the 903 MHz amp. The 12v to 24v power supply wasn’t working. I found a small glass 15A fuse that was blown. Of course, I didn’t have a spare. I rigged up something hillbilly style with a small wire. That immediately blew. I figured the amp was toast, so I snipped the power supply and TR wires to the amp, and rigged up another fuse to provide power to the TR relay. After moving a few SMA connectors, the transverter was working solo. Eric, N7EPD, helped me verify that everything was working. By the time everything was reassembled and secured, it was late (which around here means after 10:00pm). I never put up the rear antennas in CN96. Even so, the grid was remarkably productive with some 30 QSOs and three new multipliers. My last QSO of the evening was with Rick, N7EHP, who had waited up for me to transition back through CN86. The last stop of the evening was a motel in Centralia, where I hit the sack at 1:00am. The alarm went off at 5:50am so that I could be on the road by 6:15am for Kalama, WA. I was set up in CN86 near Green Mountain (a different Green Mountain than the one W7GLF was on) by 7:45am. 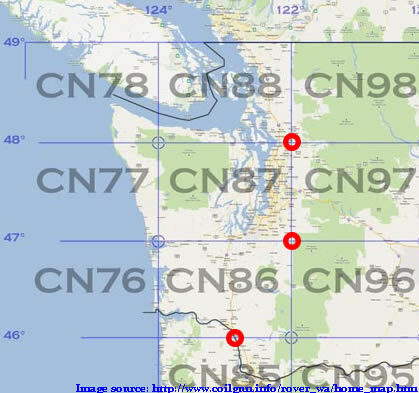 I was expecting a small pile-up of CN85 stations from Vancouver, WA and Portland, OR. Alas, it seems that the entire ham population of that metropolitan region takes a collective early August vacation. Nothing. Eventually, KB7ADO, in nearby Kelso, WA (CN86), answered my CQs on 223.5 MHz. He had other bands, and we completed QSOs on 927.5 MHz and 432 MHz. At the same time, I finally worked the first CN85 station—Dave, N7DB on 223.5 MHz. Eventually we worked on 432 MHz as well. I heard a faint CW signal on 432 MHz in response to my CQs. The signal peaked toward the NW, and after a few minutes I got KB7W in CN93—Bend, OR. I may have been working him off of Mt. Rainier as Bend is south and east of me, and on the other side of the Cascade mountains. With two hours remaining, I made a beeline for CN85, on Green Mountain Road, where a friend lets me on his property to a spot at 1,800′. The Seattle crowd came alive with this new grid, and I worked a pile of CN87 stations on 432 MHz and then 222 MHz. I also worked N7DB and KB7ME in CN85, but that was it for CN85. KB7ADO worked me on 223.5 MHz and 432 MHz, but we couldn’t quite make it on 927.5 MHz. The last hour was mostly spent trying to work people on 1296 MHz and 903 MHz. I managed QSOs back into CN87 on 1296 with K7ND, KE0CO, N7EPD and N7MWV, but 903 MHz yield nothing. I could hear people, but my 8 watt signal just couldn’t cut through the RF noise that plagues 33 cm in the Puget Sound urban areas. With fifteen minutes remaining my power booster started complaining about low voltage. In my hurry to activate CN85, I had left the truck headlights on. The pair of batteries couldn’t start the truck, so I separated the truck battery from the “radio” battery hoping the truck battery would recover enough to get me going after the contest. The radio battery was down to 9.5 volts. With three minutes remaining, I heard a weak CW signal responding to my CQs on 432 MHz. And, again, it was KB7W. This QSO was a little easier than the first one. It was a fine way to end the contest. The final (preliminary) score is 22,464, a little over twice last year’s score. It was an excellent adventure and a very good run. I was a little disappointed by the absence of activity from VE7 stations and the low turnout of stations around Portland, but the Puget Sound stations kept me going. The truck started right up after the contest, and the trip home was uneventful. Monday after the contest, I worked on the 903 MHz amplifier. The power supply fuse was replaced with a proper fuse, and everything seems to work just fine. The ultimate test will be the Fall Microwave Sprint. Evidently, when the amp gets hot, it draws enough current to blow the power supply fuse. The solution, to prevent me leaving the PTT on for too long, is a PTT time-out timer. Since I really should add a sequencer to the 902 MHz amplifier to preserve the TR relay, the timer will be easy to add.